Here we go, my first Q&A, and I couldn't be more excited about the topic! 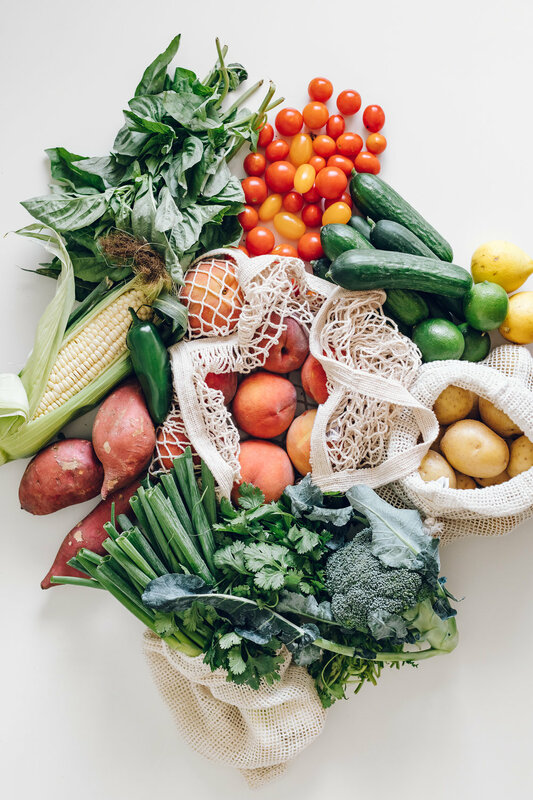 After receiving heaps of similar questions week after week when I would share my farmers market hauls with you on Instagram, I decided a Q&A on this topic was needed. I polled you in my stories and received dozens of wonderful questions (thank you!). Here are a handful of the most common that I've combined a bit, I hope you find these really helpful in some way. Let me know what you think of this Q&A idea, I'd love to do it on more topics if you're interested too. It's a neat way of getting a feel for what you'd like to hear about most, I love sharing with you! Now let's chat about the farmers market. What farmers market do you go to? And is it year-round? Living here in Orange County there are several farmers markets to choose from, but our favorite by far is the one held in Irvine at Mariner's Church on Saturday mornings. We are so fortunate to have our markets year-round, so we get our produce here each week, all year. Before when we lived in Colorado and the markets were seasonal we could only go a few months of the year, so I understand not being able to all of the time! What tips do you have for my first time visiting the Farmers Market so I am not overwhelmed? I'd recommend going without the intent to buy for your first time visiting. It's nice to get a lay of the land, see what is being offered and what the prices are, so you can better make a list for the next week! Sure, indulge in a few things you know you'd enjoy to get yourself excited - maybe a peach that smells extra nice or the most gorgeous bundle of kale you've ever seen. But don't try to buy a week's worth on your first go. It's important to get acquainted with the farmers and what they are growing before diving in, think of it like a relationship you're building. Things will get more comfy with time. How do you decide what you are going to buy, and how much? Do you meal plan beforehand? I definitely have a very specific process I go through mentally each week as I make my list for the market, but I can't say it's one that can be easily transcribed onto paper. It's something that has come with time and experience, but I will try to give it a go. I think through all of the meals we typically like to eat, which vary depending on the season and what we are into at the moment, and write down the ingredients we will need. I'll also write out a few new recipes, by myself or by others, that I might be interested in trying and see if there is any overlap in produce - or if something unique is needed. I'll make a note if I need to buy extra of something to compensate for the new recipe idea we want to include, or make an alteration to the recipe so I don't have to buy too much and can use some of our staples instead. I used to write down amounts with each produce item, but now have gotten so in tune with what we will go through that I know just how much to fill up my bags when I'm there shopping. Underbuying or overbuying certain items happens at times, and we just adjust our meals the next week to compensate if we need to. Sometimes that means freezing extra of something, or when we have less, eating more simply to avoid another trip to the market that week. Most of our meals don't require recipes, but instead are made up of taking our favorite items and combining them into a bowl or on a plate. So we use whatever items we have on hand, rather than feel like we need to have certain ingredients to choose from always. Do you only buy organic produce, or some conventional too? And how do you make sure it is organic? We do only buy from farmers who have organic practices. This isn't always labeled, and does require getting to know the farmers a bit. I've found farmers to be incredibly honest, in my experience. Either they tell me specifically how they farm organically, even though they aren't certified (its really expensive to be) or they will share how they use pesticides with me honestly - and I personally choose to not buy from those stands. There is some level of trust involved here, and I'm okay with that, so you have to choose for yourself what you're comfy with. Usually the farmers you find at markets are really passionate about the health of their produce and the land that yields it to them, so they aren't into poisoning it with pesticides. However some do, so just ask and use your own discernment. What are the reusable shopping bags that you use? And where did you get your cart? I absolutely love my organic cotton produce bags from Eco Bags. I have an assortment of sizes of their cloth bags, as well as their knitted ones too. It's really simple to just give them a wash after unpacking all of my produce, and save loads of plastic. (I have a few nylon mesh bags too that I purchased thinking they would have something extra to offer compared to the cotton bags, but they don't, I'd recommend sticking with all cotton.) As for our cart (which has saved our lives, mainly our backs!) it is by Mac Sports and we ordered it off of Amazon in green. It's not a special eco-friendly cart or anything, it just works really well and is quite large so we can fit an entire 7 days of produce in it each week. Were you and your husband both on board with doing this each week, or did one have to warm up to it? Originally five years ago, I went to a different market on Thursday mornings by myself to stock up for the following week. Since moving back to California now a second time and switching to the Saturday morning markets, we do it together! And Scott was keen on coming along from the beginning. He saw how years before my shopping at the markets had saved us quite a bit of money, and gave us the most gorgeous produce, so he found value in our weekly trips. Plus, we have such a great time together. He always makes me laugh with his sleepy morning jokes, and he really enjoys seeing all of the stunning produce change from season to season too. Could you share how to store each type of produce? This is my favorite question, and hardest question in one! I'd absolutely love to share how I prep and store every single produce item throughout the seasons all year long. But as you can imagine, that would be quite an undertaking. Seeing as I need to make a living too, I thought I would put together a produce prep e-book that would cover this for you! What do you guys think? Would you find value in something like this? What is your favorite thing about the farmers market? It would have to be the human aspect. I feel so connected to our food and the farmers who grow it by purchasing it this way. It's really a community, and I can just feel the love and pride our growers have for their crops. This really resonates with me, and I believe it comes through in our experience of eating the produce all week long. I love how over time we all get to know each other, us and the farmers, and it really turns into a relationship. Food is relational, even if it'e just you and your plate. There is a relationship there, and I feel as if it is missed all too often when we forget about the farmer. What is your budget like, and do you ever find the farmers market to be more expensive than the grocery store? Seeing as we are plant based folks over here, produce makes up for the bulk of the food we consume - so it gets the greatest budget. We also believe in paying now for our health, rather than later in the form of surgeries and medications. So with this perspective, we have a budget - but it is flexible. I know we are incredibly blessed to live this way and do not take it for granted. That being said, in the summer months we tend to spend around $100 at the farmers market each week on produce only, and around $70 to $80 in the winter months. I personally find our farmers market to be a better deal, if not the same, as most supermarkets - however, I'm not comparing their prices regularly. I make a commitment to buy from our farmers, and budget accordingly, so I can support them. If that means savoring a single basket of berries they lovingly picked, rather than gorging myself on three baskets for the same price at the supermarket, I do the former. Shopping at the farmers market is a loyalty I choose. Sometimes that means I get to enjoy abundance for nickels and dimes, other times it means I savor something special for only a few meals that week rather than every day. Any tips for getting the most bang for your buck? Saying 'shop seasonally' may not make much sense if you're shopping at the farmers market, because shouldn't everything be in season? However, each farmer has different yields of their crops. Some are more difficult for them to grow, some are easier. Therefore, their prices might fluctuate depending on how much they are able to harvest at any given time. I'd say to try to spot their high yield crops each week, and watch out for price drops when their yields are more plentiful. For example, broccoli is harder to grow in the summer because it loves cool temperatures, so you may be paying a premium for their summer-grown-broccoli. However zucchini and cucumbers are multiplying like crazy, so they would be more affordable to stock up on instead. Some farmers keep back 'ugly produce', and if you ask for their stash, they will sometimes sell it to you for a discount. Also, swinging by at the end of the market to pick up whats been 'leftover' will sometimes get you a better deal too (but slim pickings as well). Do you shop for produce exclusively at the farmers market, or do you buy items from the grocery store too? We have a local natural foods store called Mother's Market where we get our bananas and avocados from, but aside from this, all of our produce comes from the farmers market. With this being said, I'm human and forget things every once and a while! Sometimes I make myself go without it if I can, just to make myself really remember to not forget it the following week. But if it's essential, like, lemons, I'll pop down to the market and pick them up. When we are out of town and cannot make it to our usual Saturday market, I typically head to Tanaka Farms nearby and shop at their produce stand. What do you do when the farmers market goods come in plastic or other containers? We are trying to create less garbage. This is a great question. I always just ask if they wouldn't mind me emptying the contents into one of my reusable bags. I position it 'so that they can reuses the bag/box for someone else' and they (so far) have been 100% in support of me doing this, and actually seem really grateful too. What does your prep time after the market look like? Depending on how ambitious I am, and whether it is winter or summer, it can vary! We get to the market extra early, so by the time we get home it's still early morning. We typically dump all of the bags on the counter and make coffee and breakfast. After relaxing for a bit I head to the kitchen and start putting everything away. I don't prep meals for us, but I do prep ingredients. Some things stay whole, some get chopped, some get washed, some do not. On a good day I'm done within an hour or two. On a poorly planned day, it may take longer, but I usually note what I over-did and make sure not to do it again for a while ;). Other parts of my prep include soaking and cooking our grains and beans from scratch, as well as soaking and blending any nuts for milks and sauces. These things I do at various times throughout the week, depending on when we are running low, but thats a discussion for another time!